Early Medieval copper alloy zoomorphic brooch, 47mm in length, 27mm wide and 1mm thick with a weight of 14.30grams. The brooch is sub-rectangular in form and rectangular in cross section. It is in the form of a double headed S-shaped beast. The wide central portion curves around and narrows, terminating in two animal heads which are mirror images. This has a triangular upper edge with a punched 'eye' below the apex and pointed open jaws which merge into the main body. The space created between the body and the jaws is a perfect circle and this has a border of small circular punch marks, which are repeated across the top of the head. Along the edge of the main body, from the back of the neck to below the corresponding jaw, is a line of crescentric punch marks. The surface of the main body appears to have been scored with cross hatching (visible on the left as shown) perhaps to help the adhesion of the tinning/silvering which covers its surface. 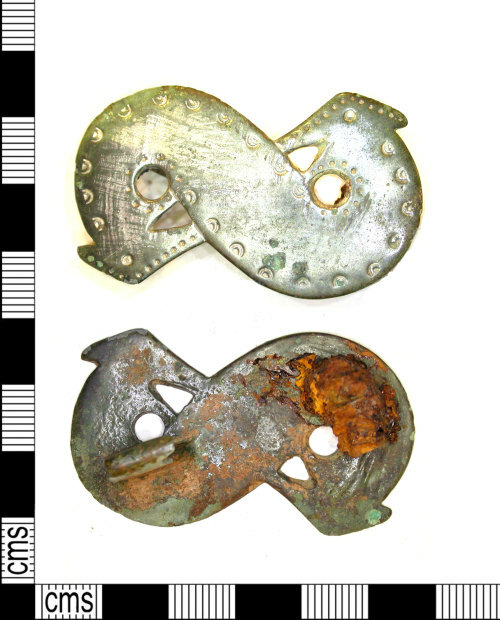 The reverse of the brooch has a rectangular shaped catch plate (10x10mm) with a turned edge sitting below one of the circular holes. On the opposite side are the remains of an iron spring, probably surrounding a semi-circular lug which is now obscured. The style of the brooch suggest it is a Frankish type, dating to 600-700AD.